November 12, 2009, Workers of CTA and SITCPLA cabin attendants unions at Iberia Airlines have called for an extended strike action for eight days. The original strike plan began October 26 and 27th, 2009. A second was called for on October 30, a one day sick out and now a two day strike from November 10 to 11, 2009. The unions are also calling for strikes for December 1, 2 and December 14-18 in order to put pressure on Iberia during collective wage talks. "We have called for eight more days because there is no will to reach an agreement,…our wages have been frozen since 2005 and...this will continue until 2011" statement from the SITCPLA union. The CTA and SITCPLA unions representing the cabin crew have forced Iberia Airlines to cancel some 800 plus flights. Iberia, Líneas Aéreas de España, S.A. is the flag carrier airline of Spain. Based in Madrid, it operates an international network of services. Its main bases are Madrid-Barajas Airport and Barcelona El Prat Airport. In 2008 the airline reported a net profit of €32 million (€327.6 million in 2007, €56.7 million in 2006, €395 million in 2005) - its 13th consecutive year of profits. Iberia transported 27,799,000 passengers in 2006 (27,675,000 in 2005). 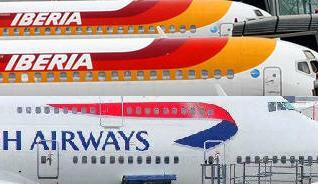 British Airways and Iberia Airlines are holding merger talks on Iberia’s 6th day of labor strikes. British Airways and Iberia Airlines have reported that they are in meetings discussing a possible merger and that an announcement could be given this week. Back in 2008, both airlines were in merger discussions however, the major stumbling block was differences over the balance of control. Both airlines are having revenue shortfalls, labor issues and facing layoffs. If British Airways and Iberia were to merge, BA would then become one of three giants in Europe next to Air France-KLM and Lufthansa. British Airways has reported their total revenue is down 13.7 per cent. Passenger revenue was down 13.6 per cent, on capacity down 3.0 per cent. Yields were down 12.2 per cent, 18.2 per cent excluding exchange, largely as a result of lower year on year surcharges and sales mix within cabin class. BA cargo business continues to be impacted by the worldwide decline in demand for airfreight although its performance compares favorably with market trends which saw volume declines of some 13 per cent during the period. Cargo revenue declined by 30.9 per cent, with cargo volumes, measured in cargo tonne kilometres, decreasing by 8.1 per cent, reflecting some stabilization in declining volumes. Cargo yields declined by 24.8 per cent driven by significantly lower levels of fuel surcharges, in line with lower fuel prices and significant market price declines. Operating costs were down 8.7 per cent, despite the weakening of sterling compared to the same period last year. Fuel costs for the period were down 17.8 per cent on last year. Other operating costs decreased by 4.3 per cent due to the continued delivery of the cost reduction initiatives launched last October. Operating costs include a charge of £48 million for restructuring. Unit costs are down 5.2 per cent. Excluding fuel, the impact of exchange and restructuring costs, our unit costs are down 5.5 per cent.